In 2017, U.S. News & World Report named Mazda as it’s ‘Best Car Brand’. Having previously been recognized by the EPA as the most fuel-efficient U.S. automaker, these awards served as a road-marker in Mazda’s continual ‘zoom-zoom’ along with an elevated engineering sensibility. Showing no interest in sacrificing the cosmetic in favor of performance, Mazda’s sense of design focus is summed up perfectly within its KODO (Soul of Motion) initiative. Embodying a singular, cohesive aesthetic Mazda’s offerings speak to the strength of the brand, while still retaining a clear sense of individuality between models. This may be best explained by exploring Mazda’s Crossover & SUV offerings. Distinctively ‘Mazda’, the CX-3, CX-5, and CX-9 are as superficially consistent with one another as they are with their sedan and hatchback stablemates. That said, they are anything but derivative. Mazda has no interest in redundancy, as evidenced by the already-enduring appeal of the distinctive CX-5. In the five years since its introduction, the Mazda CX-5 has stood with pride as a well-designed union of versatility, performance, utility, and price. 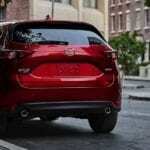 These characteristics are just a few of the reasons why the CX-5 has been able to best such in-class rivals as Toyota’s RAV4 and Honda’s CR-V. Add in the benefits of a spacious and comfortable cabin, and Mazda has successfully covered every crucial component in designing a top-notch crossover. Priced to start at $24,045 the 2017 CX-5 comes standard with front-wheel drive, with the option of upgrading to all-wheel drive. It is served up in four different trim levels: the (base) Sport, Touring (from $25,915) Grand Select (from $28,895) and Grand Touring (from $29,395). Named as an edmunds.com ‘Top Rated SUV’ the CX-5 was picked by Car and Driver as their ‘2016 Editors’ Choice: Compact Crossover’. An IIHS ‘Top Safety Pick’ the 2017 CX-5 also earned their esteem by achieving a Superior Crash Rating, the highest rating available. To any automakers looking to enroll in Mazda’s master class, affordable-pricing and award-winning are a great place to start. If nothing else, the CX-5 would be enjoyable as 360-degree eye candy. That’s hardly the end of the story, but first impressions matter. One of the most notable changes evident in the 2017 model is its refreshed front fascia. With its more open-faced grill flowing uninterrupted into elongated wraparound LED lights, there is a welcome simplicity to its design. Tasteful, yet compelling, it makes better use of space and lends the CX-5 a fun, athletic edginess. While other models seem hellbent on embodying generational revolt with their choices of colors, Mazda prefers to refine classics. While the strength of the results may not be evident in such ‘mica-imbued’ options as Snowflake Pearl (aka White) or Jet Black (aka…Black) it is more prevalent is Mazda’s iconic Soul Red Crystal Metallic and elegant Deep Crystal Blue Mica. Regardless which color you choose, the CX-5 comes with a lot for the eyes to drink in. Despite the wealth of the trim offerings available, every CX-5 is powered by a 2.5-liter inline four-cylinder engine mated to a six-speed automatic transmission. Generating 187 horsepower and 185 lb-ft of torque, the estimated fuel economy of the CX-5 comes in around 27-28 mpg. While some might view a singular powertrain as a limitation, rest assured that it isn’t. It represents a streamlined vision that empowers Mazda to offer a more inspired means of distinguishing their trim levels from one another (but we’ll back to that later). That said, an 8.7-second sprint from 0-60 mph sets the CX-5 ahead of its competition. But the output is only part of any performance equation, and in this regard, the CX-5 continues to serve up compelling arguments in its own favor. While compliant in terms of tight maneuvering, its steering speaks to the sportiness it was conceived to emulate. Weighted ‘just enough’ the CX-5’s steering effectively communicates the intentions of the driver to the road beneath, and its handling stands unchallenged as ‘best in class’. Exceptionally drivability, with impeccably reliable braking, it becomes easy to see what the CX-5 is so highly regarded as an overall performer. Mazda’s KODO isn’t limited to a beautifully sculpted exterior. Step inside the painstakingly designed interior of the CX-5 and you’ll find an equally streamlined experience. Consisting of rich material choices, it offers an open design that speaks to tasteful simplicity. No kitchen sinks were thrown into the CX-5, and it’s pleasing. With the outside dimensions offering ease of on and off-boarding, the cabin of the CX-5 is welcoming to both front and rear passengers. Spacious overall, taller passengers might find small limitations in terms of rear-seating maneuverability, but nothing excessive. Rated to seat three, the rear is certainly better suited to two adult passengers in terms of comfort. Then again, the same could be said for most vehicles that seat five. And the CX-5 is driver-centric in every way that matters. Visibility, adjustability of seating and placement of controls are nearly perfect, speaking to functionality while stirring the senses in terms of their design. The (base) Sports trim might make Mazda guilty of a misnomer, offering no true sport-inspired features. That said the Bluetooth-enabled vehicle does offer Mazda’s Connect infotainment system built around a 7-inch touchscreen (with backup camera) and four-speaker sound system with two USB ports. The Touring trim steps up a level with keyless ignition and faux-leather interior, and the heated front seating is further enhanced by adjustable driver features. The sound is pumped up to six-speakers and safety features are increased to include blind-spot monitoring and rear cross-traffic alerts. The Grand Select serves to evoke luxury features, such as a Bose audio system with satellite radio and navigation system. The cabin is enhanced by a moonroof, while drivers benefit from turn-swiveling headlights and a power liftgate. The Grand Touring employs, even more, safety and driver assist features and further enhancement packages that serve to make the CX-5 amazing well-equipped despite the simplicity of its design. An achievement unto itself, Mazda’s CX-5 is on-brand but never redundant, inspired in its simplicity and affordable while offering strong value. Truly the ‘soul of motion’, it is worth the consideration of any driver who likes a little bit of everything in a vehicle, all while valuing the clarity of a refined design. No kitchen sinks were harmed in the making of the Mazda CX-5, but you would never know it considering everything that it has to offer.